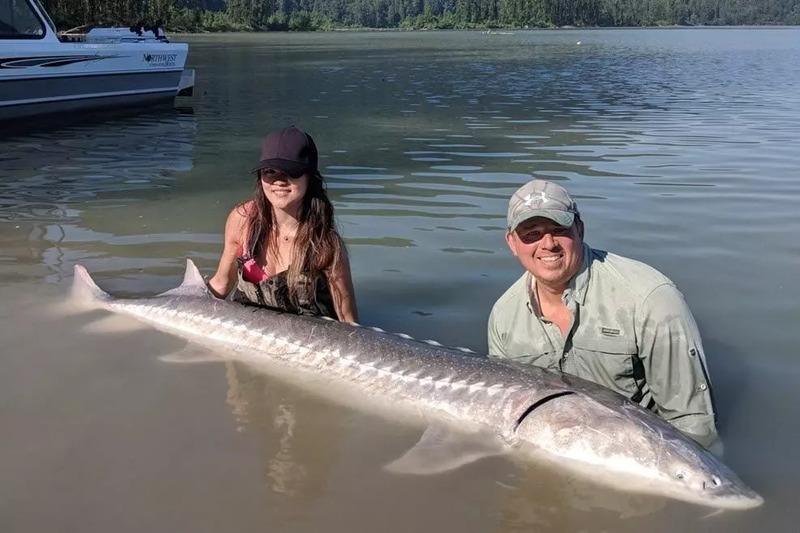 White Sturgeon are survivors from the dinosaur age and white sturgeons are the ones you will find in the Fraser River. White sturgeon are among the largest and longest-lived of the many sturgeon species and of freshwater fish in North America. Amazingly, sturgeon have remained virtually unchanged since they first appeared in the fossil record 175 million years ago. White sturgeon are at the top of the Fraser River food chain and one of the few year-round resident species of fish. The white sturgeon has quickly become a popular game fish, pursued by anglers from all around the world. When they are caught they put on quite a show and often leap into the air. 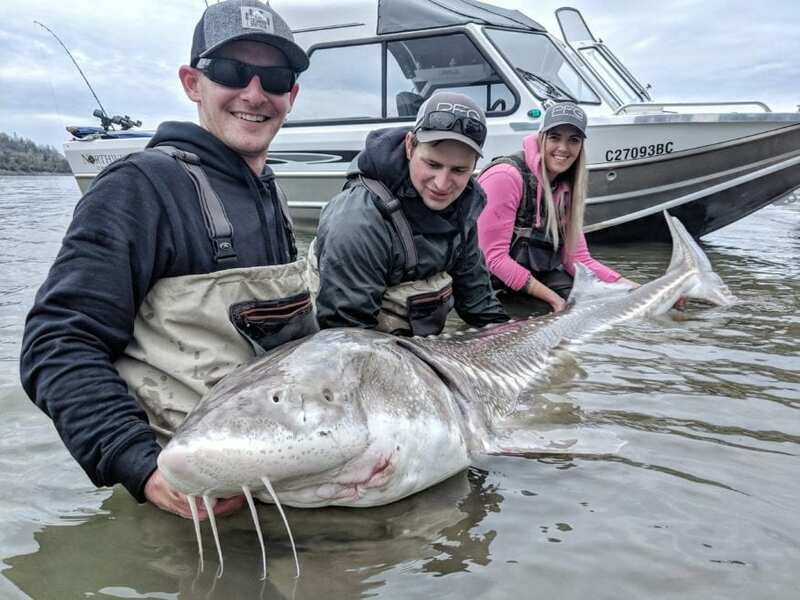 There are many white sturgeon residing in the Fraser River and sturgeon fishing is available year round but prime season is between March and November. There are two major feeding periods when sturgeon fishing is at its best; April- June and September- November. During the winter months most fish being caught are smaller (2 to 4 feet is average). Successfully catching sturgeon involves finding them. There are two ways to fish for white sturgeon; from a boat or from shore. Rods and reels used are different for each method. White sturgeon for the most part, tend to concentrate in holes, seams or drop-offs within the river bottom. They also enjoy hanging out in back channels of the Fraser. Fishing a variety of baits is the key to finding what’s working best that day. Using a bait that is present in the area will produce larger fish. Some baits that are used are eulichans, lamprey, ditch eels, headless fin fish, dew worms, Salmon gills and salmon roe. It’s best to have a variety on hand when trying to allure some sturgeon. If you are interested in catching some white sturgeon, I over 37 years of experience fishing the Fraser River and can accommodate all levels of fishing experience. Contact me for more details about our Fraser River fishing trips. 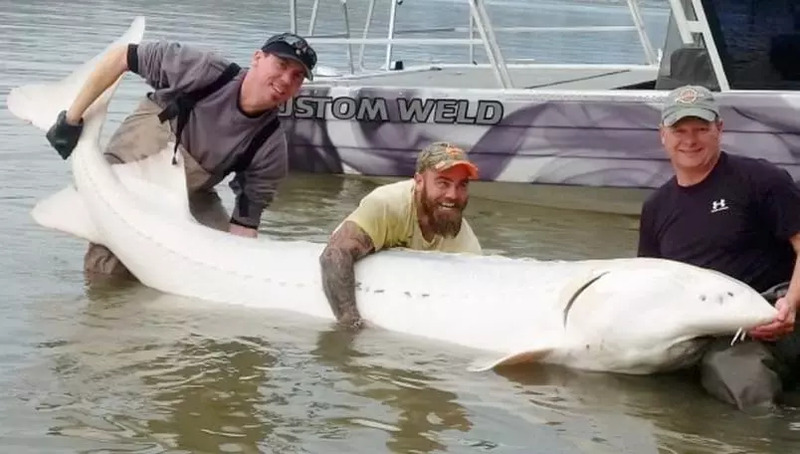 Canadian fisherman landed a rare and enormous albino sturgeon that very well might be a world record with the fish measuring an incredible 11 feet, two inches and weighing an estimated 1,000 lbs or more. After taking photographs at the shoreline, Helmer released the albino sturgeon, leaving him with amazing memories. With the high number of anglers partaking in this fishery, it’s very important that the fish have been managed properly to minimize effect and make sure that the fishery is sustainable. The Ministry of Forests, Lands and Natural Resource Operations (with assistance in the Fraser River Sturgeon Conservation Society, Fraser Valley Angling Guides Association, Recreational Sturgeon Anglers of BC, and Fisheries and Oceans Canada) has created guidelines for catching and correctly releasing sturgeon. Anybody who fishes for white sturgeon on the Lower or Middle Fraser River is invited to read and follow the Guidelines for Angling White Sturgeon at BC. The Fraser River Sturgeon Conservation Society (with assistance in the Habitat Conservation Trust Foundation, Province of B.C., Fisheries and Oceans Canada, along with the Rick Hansen Foundation) has also put together a movie which covers those recommendations in more detail. Strategies for Angling Sturgeon at BC.